"La Bougainville" is a newly built hotel, located in the centre of Anacapri, the most exclusive and romantic place of Capri island; it rises at 300 meters above the sea level in a worderful garden of trees and flowers typical of Capri. 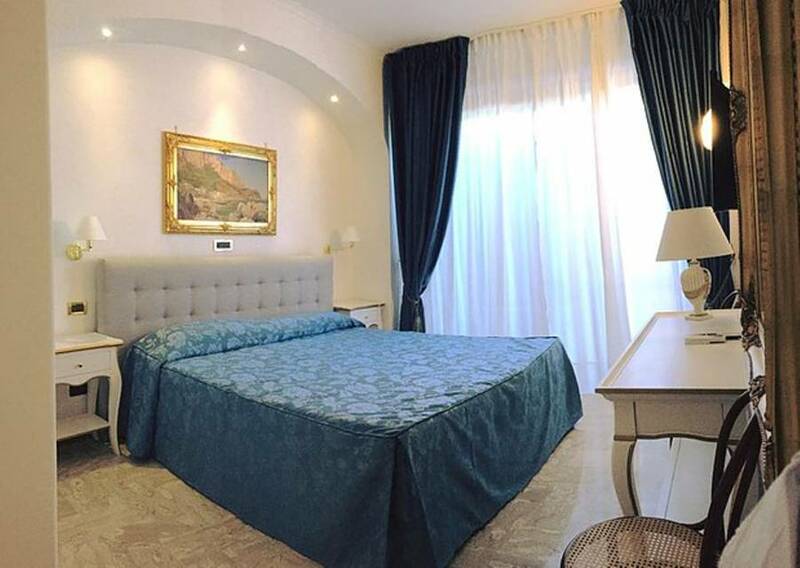 Surrounded by trees and flowers of every kind, the hotel is furnished in modern style and all the rooms have private balconies with a charming view of the centre. 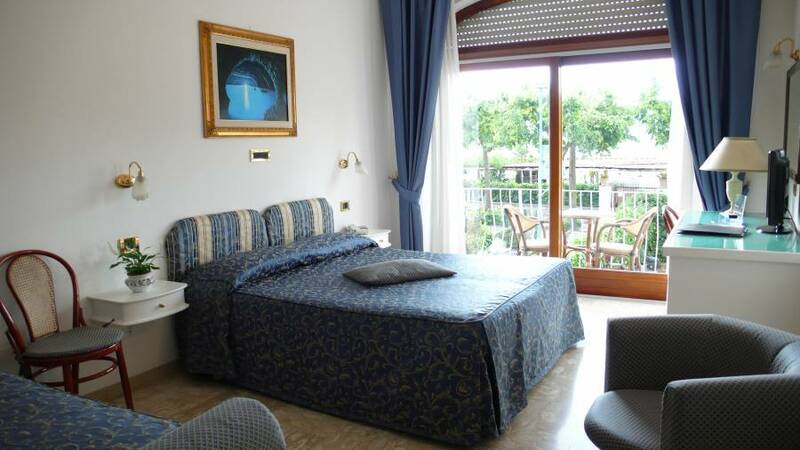 The hotel is a few steps far from the famous Axel Munthe's Villa San Michele and from the chairlift for mount Solaro; the wondeful Blue Grotto is far 5 minutes by bus from us. 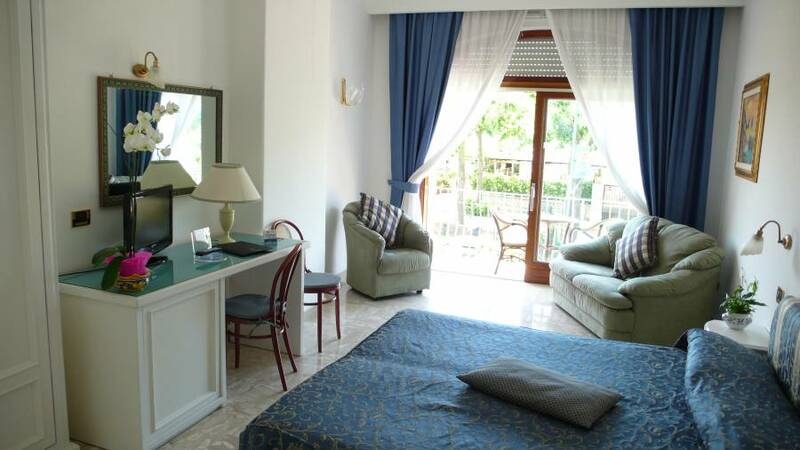 "La Bougainville" has standard rooms and a few suites. All the rooms are furnished in modern style and equipped of every comfort (air-conditioning, heating, TV, telephone, hairdryer, etc. 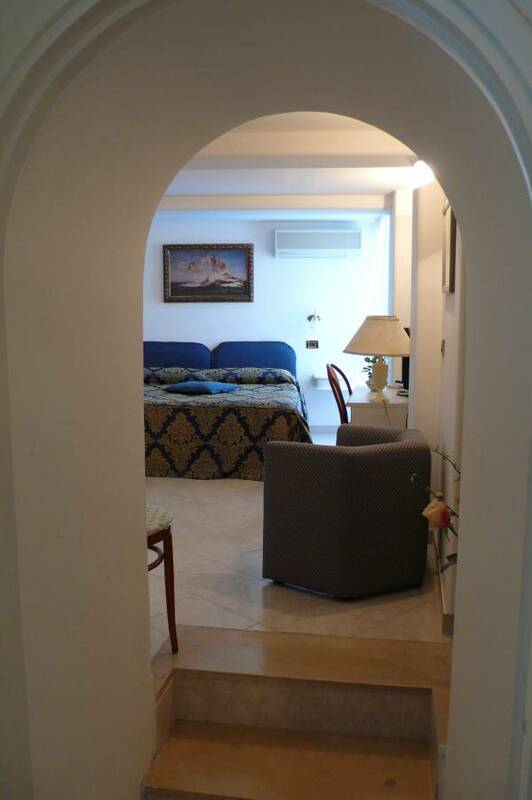 ); each room has private balcony with view of the centre. The hall, built with artigianal works, is the symbol of our hospitality already from the first meeting. Here our employees will give you the best assistance, so your stay will be unforgettable as well; they can plan personalized marine excursions and guided tours. At the Reception you can speak English, Spanish, German and French. We accept credit cards VISA, Mastercard, American Express, Diner's, Maestro, Cirrus, and Pagobancomat. The restaurant and bar is available as room-service all the day. 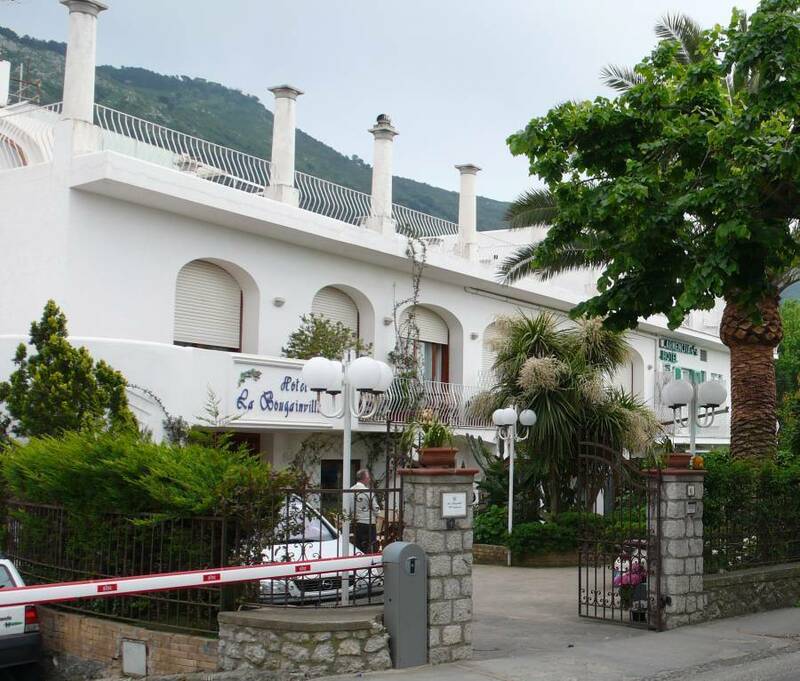 "La Bougainville" is located in Anacapri center, 300 mt. above the sea level, in an enchanting garden of typical trees and flowers. the famous "Grotta Azzurra" (Blue Grotto), wonderful marine cave charactherized by an intense blue, where the sunlight effect generate incredible color playings. "Punta Carena", charming place located on the south-west coast of the island, suitable for nice swimmings until the sunset. "Villa San Michele", the famous Axel Munthe's museum, rich of archeological rest of the Roman and Greek period, of examples of the life in Anacapri at the beginning of the '900, and of a rare collection of local botanic and ornithologic species. The "Scala Fenicia", a Greek and Roman work, was the first connection between Anacapri and the port; important for its almost 700 steps built by hand with Capri stones. Mount "Solaro", the top of the island, is a panoramic terrace on the whole island, where you have the view of the gulfs of Naples and Salerno. Reachable in a few minutes by a chairlift. The "Migliara" and "Cetrella", places where you can discover the nature and the inexplored Capri. Breakfast, taxes and services included. 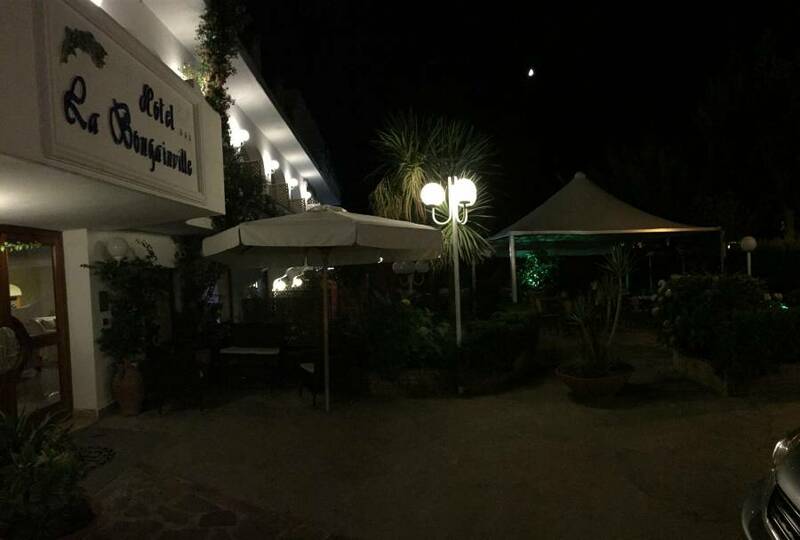 We are located in Anacapri center, 300mt after the main square Piazza Vittoria. Shuttle is available from the port on request and with an extra fee. Other transportation options are taxi and buses to Anacapri (we are at the 2nd stop after Victoria square).